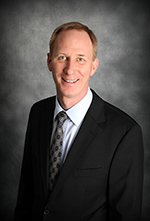 Dr. Mackner is a graduate of Moorhead High School and earned his Bachelor of Arts from Concordia College, Moorhead, Minnesota. He attended Pacific University College of Optometry in Forest Grove, Oregon where he earned his doctorate. Dr. Mackner received additional training in general practice, pediatrics, contact lenses, and the diagnosis and treatment of eye disease at the Oak Harbor Naval Hospital, Oak Harbor, Washington. He is an active member of both the Minnesota Optometric Association and the American Optometric Association. Dr. Mackner is a past Education Chair for the Minnesota Optometric Association as well as a Past President of the Minnesota Optometric Association. Dr. Mackner is a Diplomate in the American Board of Optometry and has earned numerous awards and recognitions including Minnesota Young Optometrist of the Year in 1996, and was recognized as the Minnesota Optometrist of the Year in 1998. His interests, when time allows, includes spending time with his family, hunting, fishing, basketball, water skiing, and gourmet cooking. Dr. Mackner, and his wife Connie, have three sons, Andrew, Joshua, and Mitchell. Schedule an appointment now with Dr. Mackner.